Tyler Kroft is coming to the end of his four-year rookie deal. 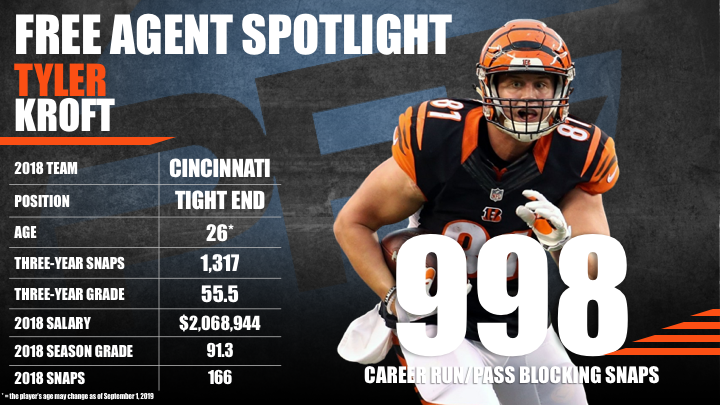 The third-round pick has been a solid blocking and receiving option at a tight end position that has struggled to stay healthy and produce for the Bengals. He was used primarily as a blocker, run-blocking or pass-blocking on 998 snaps to just 677 passing snaps across four seasons. Kroft earned two single-game grades over 70.0 this year before his season was cut short due with a broken foot. While Kroft hasn’t wowed with his grades, earning a career-high season grade of 64.9 as a rookie, he has been a consistent and flexible option. He plays most of his snaps at inline tight end but can also line up in the slot to catch passes or in the backfield to provide extra blocking in the run-game. He also can contribute on special teams, where he played 531 snaps in his first two seasons, earning a respectable 71.7 grade in 2015. His best season as a receiver came in 2017 filling in for the oft-injured Tyler Eifert, producing 404 yards and seven touchdowns along with a receiving grade of 62.7. If the Bengals choose to move on, the team that acquires Kroft will be getting a solid, multi-dimensional player who can contribute across all phases of the game.